Combining chess and art is a favorite pastime of both artists and some chess professionals. Chess so pervades popular (particularly Western) culture that there are countless examples. Usually it is artists drawing from chess imagery or themes in their work. However, once in a while you can find chess aficionados with little artistic background approaching the subject from the other side. 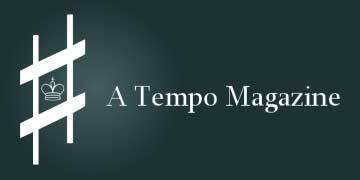 A Tempo Magazine, printed in Dutch, but also available online in English, lauds itself as "a chess magazine for music lovers," or, alternatively, "a music magazine for chess lovers." Each monthly issue centers around a theme and offers "a motley collection of short stories, opinions, poems, bizarre brainwaves and jokes." 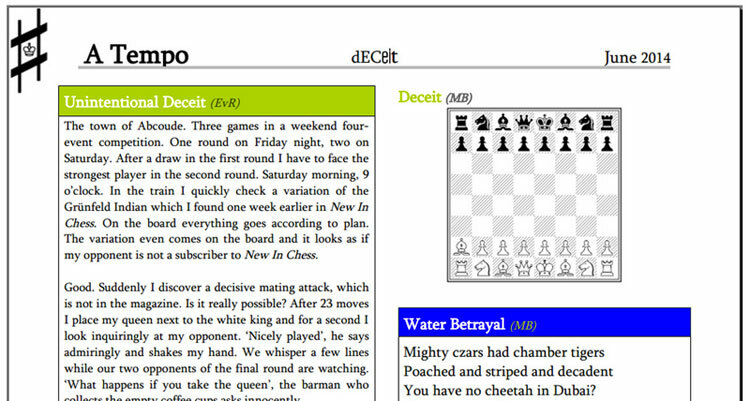 The magazine's editors include Eric van Reem, chess blogger and member of the Chess Tigers team working with Vishy Anand, Peter Boel, an editor at New in Chess, and Martijn Boele, a writer and musician. Recent issues have taken on "temptation" and "deceit," and you can find the first page available for free on their web site. Excerpt from page 1 of the June issue, "Deceit"
In recent years one of the more reliable places to go for interesting chess-themed art is the World Chess Hall of Fame in St. Louis, USA. In addition to permanent galleries honoring chess greats from the U.S. and around the world, the WCHoF is a full-fledged museum with something for everyone including those who don't know their bishops from their pawns. For the more chess-history inclined, this is the last week to catch the exhibit on Jacqueline Piatigorsky who, in addition to being a top female player in the U.S. herself, famously organized the 1963 and 1966 Piatigorsky Cup along with numerous other chess ventures. The museum is also hosting exhibits combining chess and music. 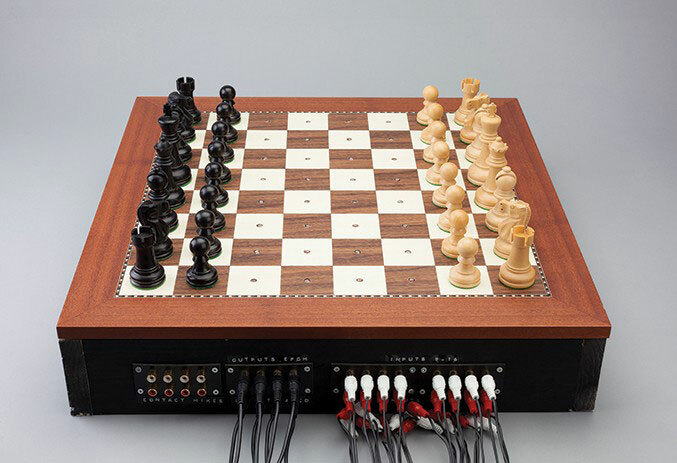 Cage & Kaino: Pieces and Performances runs all summer long and features work from composer John Cage and multimedia artist Glenn Kaino, who, though not contemporaries of each other, share similar inspiration and a fascination for chess, which had a direct bearing on their art. 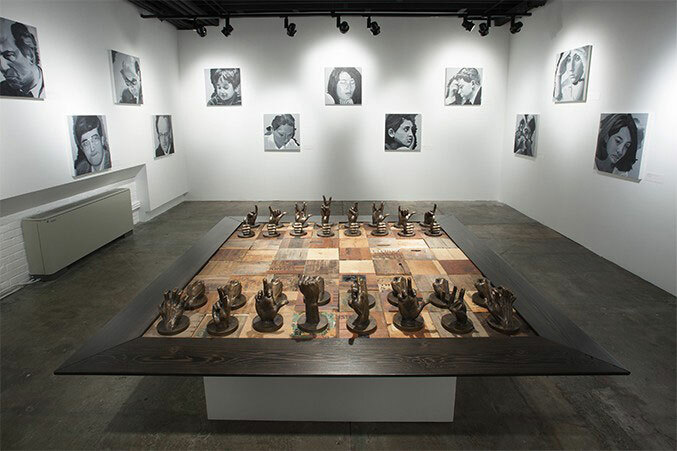 In one room you'll find Kaino's massive chess set and board, entitled Learn to Win or You Will Take Losing for Granted, flanked by a collection of portraits of grandmasters called One Hour Paintings. John Cage was an avant-garde composer who came to prominence in the 1950s and 60s with beguiling works such as the 1952 "composition" 4′33″ (as in "Four minutes, thirty-three seconds"), which consists entirely of musicians not playing their instruments and instead letting the ambient sounds of the environment and the audience take the fore. Among the items on display is a recreation of Cage's Reunion chessboard, a musical instrument where the sounds are generated from the movement of the pieces. Visitors to the gallery have the opportunity to play a working replica. Reunion premiered in 1968 in Toronto, when Cage played against Marcel Duchamp, who in fact taught Cage to play chess. Duchamp of course was a serious player as well as a great artist, and won the game in short order despite giving Cage knight odds. Much more information and many photos are available at worldchesshof.org, but of course the best way to experience the exhibits is in person! You can also learn more at Artsy.net's John Cage page.